Various roofing materials can make roofs environmentally friendly and energy-efficient, writes Cris Carl. For instance, metal and clay shingles are durable and recyclable, and reflective and green roofs can reduce heat and save energy. However, some experts suggest you take note of climate patterns that may affect the quality of sustainable roofing materials, and think as well about their maintenance needs. When you think of having a “green” roof, there are a number of concepts and materials to consider. First you need to ask yourself about what you are hoping to accomplish. Are you looking for energy savings? Do you want to cut down on your carbon footprint? How far do you want to go and what level of expense do you want to employ? If you are either building or remodeling, here are a few ideas to consider if you would like to have a green roof. The company specializes in metal roofing that is coated in granite to give the appearance of asphalt shingles. “They (the metal roofs) don’t wear out. They are guaranteed for the lifetime of the homeowner and the guarantee is transferable,” said Lynch. Essentially, once the metal roofing is installed, that’s it. “Even if for some reason all or a portion of the roof needed to be replaced, all the materials are one hundred percent recyclable,” said Harris. Harris added that it’s important to remember that asphalt tiles are a petroleum product that wears out relatively quickly and is a pollutant in landfills. Another benefit to having a granite coated steel roof is energy savings as the materials “alleviate the heat from the wood in your attic,” said Harris. The roofing materials keep heat out and reflect heat, which is a type of roof know as a “cool roof.” Lynch said that steel roofs are actually lighter than asphalt and can be placed over up to two layers of traditional asphalt roofing. “That also saves on more asphalt ending up in a landfill,” said Lynch. In addition, besides never having to replace your roof again, there is no maintenance required according to Harris. “It’s totally maintenance-free forever,” he said. If you live in an area where it snows, the standing seam construction of a steel roof helps prevent heavier snow loads and less snow-related hazards Harris added. The use of lighter colored materials in roofing in general is known as cool roofs. Dark roofs absorb the sun’s heat and up your cooling costs. “Cool roofs reflect the heat back out into space. Asphalt absorbs the heat and transfers it into your home,” said Lynch. For a little more in-depth discussion of cool roofs. wood shakes are a green material and is 100 percent recyclable (they can be turned into wood chips), they wear out in 15 to 20 years maximum, not counting any type of storm damage. “They (wood shingles) are very popular here in New England. But you have to expect that the heat and cold will cause them to expand and contract, which will break them down over time,” said Harris. 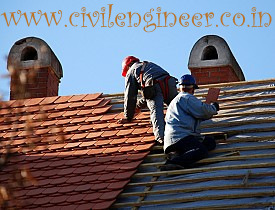 Clay roofing tiles are a green material that is best used in regions that are predominantly hot more of the year. Harris said that clay roofing materials can be durable and are recyclable, but are not meant for regions where there are extremes in heat and cold. “They just won’t hold up (in that kind of environment),” he said. Horticultural green roofs are an idea dating back thousands of years. In general, you have to have a solid base of well-sealed roofing material before soil mixtures and plants can be added. Horticultural green roofs are easiest to create on flat roofs, and require a good deal of upkeep, often professional. Horticultural green roofs can be done on slanted roofs and might be a consideration for a portion of a homeowner’s roof. Soil is layered anywhere from three inches to over two feet depending on what types of plants you would want to grow. Mosses, sedums, and grasses for the lesser amounts of soil and shrubs, hedges, and trees for the larger amounts. Root barriers, and depending on the location, an irrigation system would also need to be installed. The idea of a horticultural roof is popular in some urban areas to create green space, reduce rooftop reflected heat, reduce pollution, improve storm water runoff, and in some cases, generate crops. The Environmental Protection Agency states on their website that sod roofs, or rooftop gardens are initially more expensive to install, but savings can be seen in energy costs and costs of storm water management. The EPA estimates that costs to install a sod roof run approximately ten to twenty-five dollars per square foot. Annual maintenance is estimated at seventy-five cents to a dollar-fifty per square foot.